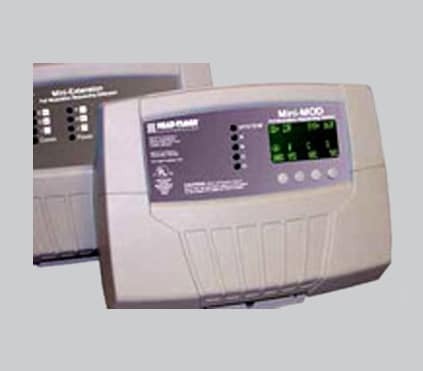 The Mini-MOD-CNC is an outdoor reset multiple boiler heating control. It operates two different groups of boilers, condensing and non-condensing. It operates both modulating and multi-stage boilers. It changes the lead boiler group to condensing when the system target temperature is below a specified switching set point. However, when the system target temperature rises above the switching set point, the Mini-MOD-CNC will switch the lead boiler group to the non-condensing. This design evolved from heating applications need to increase their operating efficiencies while reducing their equipment initial investment. 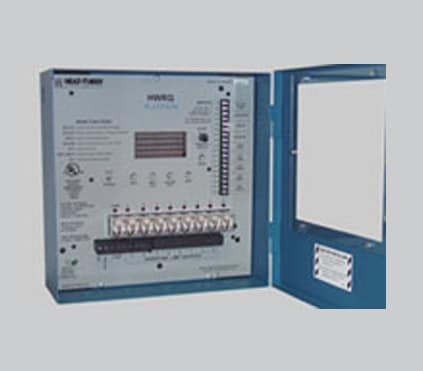 System Target Temperature Switching of Lead Group: The Mini-MOD-CNC uses a target switching set point with an adjustable switching delay. If the target temperature was below the switching set point, the Mini-MOD-CNC will use the condensing boiler group as the lead boiler group. If the target temperature rises above the switching set point for a specified delay period, the Mini-MOD-CNC will switch the lead boiler group from the condensing to the non-condensing lead boiler group. Parallel or Normal Modulation: For the modulating group of boilers (condensing or non-condensing), an advanced PID logic has been used to provide an efficient, smooth, and adjustable modulation that can fit most applications whether the boilers are to sequence normally, one after the other, or in parallel. With numerous configurable parameters like Ignition %, Modulation Start %, Gain, Lag Delay, Soft-Off , and Last Stage Hold, the PID logic can be adjusted to meet any building specific heating application. Domestic Hot Water Control with Optional Priority It can be configured with Domestic Hot Water call option. It will increase system water temperature when Domestic Hot Water is needed. In addition, it allows for optional priority of the domestic hot water over heating. The Mini-MOD-CNC comes complete with both the System and the Outdoor sensors. My hot water outdoor reset control is giving me too much heat. What should I do? Check if the control has any of the following: •Reset Ratio and Offset – If excessive heat occurs only in certain weather conditions, adjust the Reset Ratio and Offset. If excessive heat occurs year round, reduce the Offset. •Boiler Mode Settings – The control will only operate boilers their mode is set to Auto or Standby. Check to if any boiler stage is set to Manual or On. •Multi-Stage Control Settings – The Last-Stage-Hold will allow only the Lead boiler to stay on for an additional number of degrees. If the setting is too high, and only the Lead boiler is on, the system can over heat. Reduce the Last-Stage-Hold setting. •Domestic Hot Water Call – On a DHW call, the System Set Point will rise to the DHW Set Point or 200°F. If the increase in temperature is during DHW call, see about using any of the DHW Priority options available on the control. Why does my Heat-Timer hot water reset control (HWR) flash OPN instead of the outdoor temperature? 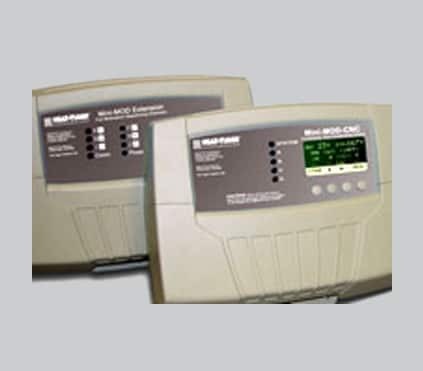 Heat-Timer controls use the code OPN when they can not detect a sensor. For example, if someone were working in the building and cut the wires leading to the outdoor sensor, the HWR would begin to flash OPN to signal that the sensor was no longer attached. 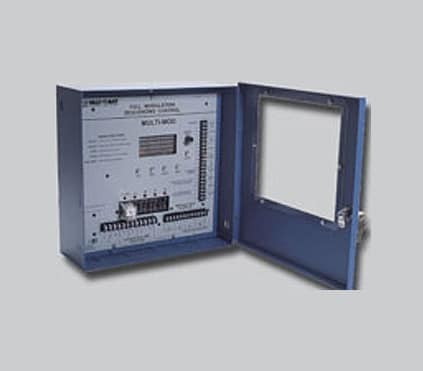 To find the source of the OPN reading, first make sure that the outdoor sensor wires are attached to the input terminals (the IT terminals in the case of an HWR). Then place a jumper wire across the input terminals (IT). The display should change to read SH-I (the code for a shorted sensor). If the display does change, the HWR is working properly. Check the wires to make sure they are not broken, and locate the sensor to see if it has been damaged.